Hardware Lane is an unusual part of Melbourne. Diners accustomed to blithely opening unmarked doors, scurrying down hidden staircases and striding fearlessly along laneways to reach fabled restaraunts are, in this part of town, suddenly confronted by maitre d's making themselves, and the restuarant, as conspicuous as possible. There are some pretty extensive menus being proffered, but we elected to go with a restaurant that, with a more succinct menu, could perhaps dedicate themselves to turning out a select ion of very good dishes, rather than pages' worth of OK ones. Housed in an old warehouse, il Nostro Posto aims for an authentic trattoria feel: framed 'Roman Holiday' prints on the wall; banter in Italian between the staff; and a specials board with Fileto di Manzo and Cotoletta di Vitello. Something in the bright lighting, or the dark wood finish meant the effect didn't quite hit the mark for me. 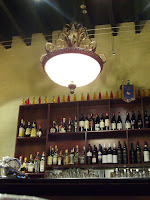 The wine list is certainly a helper towards the authentic Italian vibe. On our waiter's advice we drank a newly-arrived Sicilian white from the Rallo vineyard. Very dry mouth feel, but with an equally fruity palate. After my recent wranglings with whole artichokes I had great admiration for this well-sized, entirely intact and deliciously steamed/boiled specimen. I was also able to mix the leaves in or savour their nutty flavour alone as it pleased me. 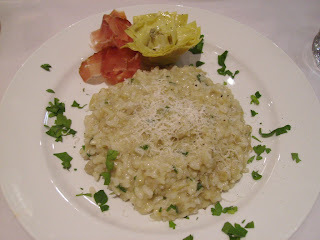 The risotto had good consistency and wasn't over-salted. I'd seen a cook carrying tubs of stock through the restaurant, which in my imagination had been ladled out of an ancient, hundred-litre bubbling copper vat in the cellar! 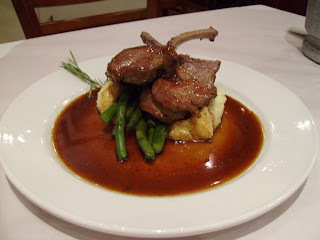 The 'burning finger' lamb cutlets are named from the Italian term indicating that they're eaten hot from the pan with your hands. Again, very visually pleasing. The lamb was thick- cut and well-cooked - juicy pink in the middle. Crisp beans, creamy mash and plenty of soaking gravy...our location may not have epitomised Melbourne but the weather, which had dropped 15 or so degrees in the day and brought plenty of cold rain, certainly did and this dish - part BBQ favourite, part winter-warmer - fitted the conditions perfectly. 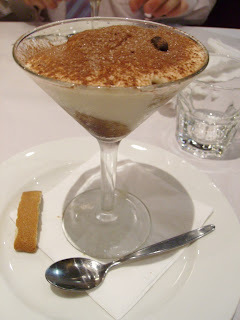 Dessert featured a housemade tiramisu, a dish in which the total should be greater than the sum of its parts. The parts were fine: rich cream, studded with coffee beans, and lots of moist sponge fingers. Unfortunately most of the coffee drenching had dropped to the bottom of the cup, so it was a bit like attacking a drink that you haven't stirred with spoon, and hitting all the gunk at the bottom. Regardless, it was undoubtedly fresh and very enjoyable. 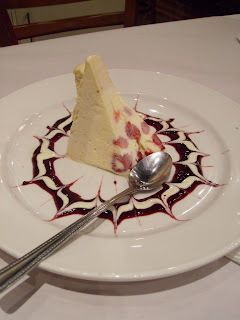 Lastly, a picture-perfect fruits of the forest semi-freddo brought together sweet and creamy wedges with a delightfully tart coulis - sensational flavour combinations.